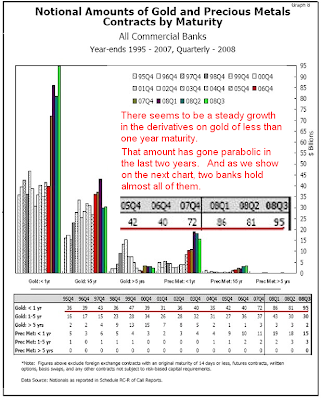 GATA takes a look at Central Bank Gold Reserves. Submitted by cpowell on Mon, 2005-05-16 07:00. What is the CPM group telling us? Well, implicit in the first sentence is the fact that Gold was NOT FIRM because of previous Gold sales. In other words, it was these Central Banks that kept the Gold price from rising. Average sales of 435 tonnes per year totals 6500 tonnes over the period. According to the World Gold Council Central Banks had 35,582 tonnes in 1990 and 31,423 as of March 2005. They are only admitting to sales of 4159 tonnes, not 6500 tonnes. The difference is 2300 tonnes. Then the CPM estimates 2005 Gold sales of less than 250 tonnes which is half the amount allocated under the 2nd Washington Agreement. This is VERY bullish for Gold. Gold investors have long waited for the end of Central Bank dishoarding. Is this really it? Can we learn something from past behavior of the Central Banks? The CPM group, like many others, likes to lump all Central Banks together and scare us with their Billion ounces of Gold. Gold just waiting to be sold to snuff out any rally. What I' ve done is check the historical record over the past 25 years and prepared a series of Tables. I' ve divided the World into a series of Blocs with some loose parameters such as geography or political allegiance. Each table shows Central Bank Gold Reserves in Tonnes for 1980, 1990 and March 2005. At the bottom of each table are the Bloc Totals in Tonnes and then in US Dollars converted at $420 per oz. All the numbers come from Tables found at the World Gold Council Website. The numbers are derived from Official Central Bank releases that may or may not be accurate. I doubt all of them are accurate. For example, we know a lot of Gold leasing has taken place yet leased Gold can be included in the Reserve reports according to IMF rules. Gata has circumstantial evidence that many thousands of tonnes have been leased but we do not known by whom. Let' s begin with the Muslim nations. The most striking thing about these numbers is the lack of change. Many of the holdings have not changed in 25 years. But neither have their rulers. In many traditional societies, and this includes nations in the Middle East, the Indian subcontinent and South East Asia, Gold has never lost its lustre. Their Central Bank Gold Reserves are untouchable precisely because Gold is a proven store of Value. Although many of the Nations listed above are now (or soon will be) members of the European Union I listed them with Russia because I believe their Gold reserves are not in play for similar reasons. Unlike many Western European countries, these ex Soviet nations have minimal Gold Reserves. Compare France with 51% of its Reserves in Gold with Poland (only 3.9% ) or Russia (with 4.1%). In fact, one could argue that as these nations prosper they will become Gold buyers as Russia certainly is. This bloc is mainly the story of Venezuela and Argentina. Brazil, Chile, Columbia and Uruguay are in the USA bloc (see below). Until 2003 Argentina would have been in the USA bloc as its Gold reserves had dropped to less than a tonne. But now it is buying Gold and its currency no longer is tied to the US Dollar. Venezuela has had such turmoil over the years one wonders whether or not those 357 tonnes are really there. If not, they cannot be sold twice. If they are there, given the current government, I do not think they are in play. This Table does not include Indonesia and Malaysia which are in the Muslim Bloc. Like the peoples of the Middle East, Asians place great trust in Gold. Their cities have thriving Gold Markets. China now dominates Asia with India growing quickly. Both nations are adding to their Gold reserves and will continue to do so. Japan, which has the largest Asian economy, has been in and out of recession for 15 years now. Given this and especially their ultra low interest rates, I find it hard to believe Japan has retained all the Gold it had in 1980 but that' s what they claim. Taiwan added Gold until 1990 and then stopped. We know that thousands of tonnes of Gold have been leased but we do not know by whom. Japan and Taiwan would be good candidates. Here we have the Challenger. The Europeans wants the Euro to be a Reserve Currency. The Euro has some Gold backing. Europeans own half the Official Gold in the whole world. To the 13,650 tonnes listed above we must add their portion of IMF (3217 tonnes) and BIS (206 tonnes) Gold. During the past 15 years, while the Euro project was in its formative stage this Bloc sold over 3800 tonnes of Gold. This stabilized the US dominated system. However, the Europeans are now claiming they will sell very little Gold going forward. Finally we come to the USA Bloc. This is an amazing Table. All of America' s closest allies are SOLD OUT. Australia claims to have 80 tonnes but it is probably encumbered. The UK may still have 312 tonnes but, assuming it isn' t already encumbered, this Gold may be required to obtain currency union with the Euro zone. How much of this Gold is available to prevent the Gold Price from rising? I do not know. But quite a bit of it seems off limits. I think we can safely say that if Japanese and Taiwanese Gold has escaped leasing thus far then it will continue to do so. The IMF Gold is potentially saleable but as the CPM report states it is currently bogged down as it has been for a decade. Assuming most of the American Deep Storage Gold is no longer available the only real source of future Gold is Europe. But Europe has a tricky role to play. They want to be part of a dual currency Reserve System but they mustn' t destroy the Dollar and bring down the whole thing. European respect for Gold is deep rooted. The key nations are France and Germany. The French regard financial instruments with great suspicion. They all know the story about someone' s great uncle who papered the water closest with Imperial Russian bonds. Further back there is the cultural memory of John Law and the Mississippi Bubble and then the Revolutionary Assignats. In Germany too this feeling runs deep for the country was ruined by fiat paper only 80 years ago. Over the past few months we have seen a pitched battle in the German Press with one side advocating further Gold sales and the other saying no. The need for fresh Gold supply must be acute. The CPM report seems to indicate that the pro Gold crowd now have the upper hand. The United States is desperate to maintain the privileges associated with the global Reserve currency but has recklessly disregarded the responsibility of guarding the Dollar' s purchasing power. It has called upon allies to support the Dollar either by selling their Gold Reserves as shown in the USA table or by buying US Debt paper as the Asian Central banks have done. They have now reached a dead end. Those who once had Gold Reserves now have empty vaults and the Asians now realize their vaults are full of irredeemable debt. 1) All of America's closest allies are SOLD OUT of gold. 2) If the US' s “Deep Storage Gold” does not exist or is encumbered, then the USA bloc is broke. 3) Europe holds a lot of gold reserves: 13682 tonnes of it! 4) Europe' s deep respect for Gold means that most European gold is probably unencumbered (hasn' t been sold/leased off like in the US). This is especially true for Germans who went through hyperinflation 80 years ago and probably don' t want to repeat the process. 1) If most of the US' s allies are out of gold for leasing/sale, then the US is probably too. 2) In addition to having leased/sold most if not all its 8,133 tonnes, the US has sold substantial amounts of “paper gold” via two commercial banks. Based on the 124 billion short position seen in the charts below, the US is probably short around 4,400 tonnes of gold. Euro zone holds 10 thousands tonnes of gold reserves. 1 tonne is approx. 30000 oz. So, if i am correct, euro zone holds 300 millions ounces, which is worth approx. 0,3 trillions US$ today. I do not believe it can has major impact on currency, since debts are being counted in trillions or even tens of trillions US$. I would agree with the rationale above, as long as the gold-to-USD value ratio remains relatively constant. However, if/when values for each change substantially, ie. gold up, USD down, than gold may very well in fact impact currency value to a very high degree. Especially if faith in the USD declines dramatically or were to lose its reserve currency status. We're not there - yet. With regards to gold reserves and the leasing/selling thereof, what are readers thoughts regarding investing in either gold &/or silver via 'paper' investments such as GLD and SLV ETFs? Too much risk involved due to possible manipulation or governmental decrees vs. holding physcial bullion? Could you please comment on the paper about hidden gold reserves of USA looted from Philipines in 1986? If the facts from the above article are true, US Government-trusted banks (JPM/GS/HSBC) could now manage the price of gold and thus maintain unbelievably large short positions because they simple have that much gold. Eric, I'd like to join poster above and ask you if can have a look at http://www.scribd.com/doc/9421535/Collateral-Damage-Part-2-The-Subprime-Crisis-and-the-Terrorist-Attacks-on-September-11-200126122008 article. I had a look at the paper and it was interesting. However, it doesn't really change anything. Even if this secret gold did exist, which is possible, it is now long gone. Rising gold prices are proof that the US is running low/empty on gold to sell.